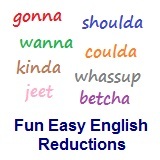 ﻿ Fun Easy English - new-american-english-reductions-reduced-words-topic-word-you-what-are-you-whaddaya. Whaddaya planning to take in college? Whaddaya going to do tomorrow? Whaddaya planning to do with your girlfriend this weekend? This English language reduction is used often especially in places like New York. If you travel to New York you might listen to a native English speaker shout out "Hey, whaddaya doing" to someone if they are angry.